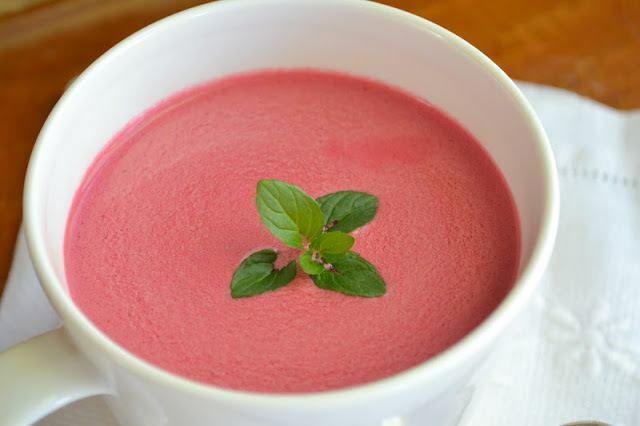 Chilled Beet Soup ~ Cold soups are fun in the summer, especially if you are entertaining and need something that can be made ahead. Melt the butter and oil in a heavy pot and saute all the vegetables for about 5 minutes over medium heat. Add in the stock. Bring to a boil, lower the heat and simmer for about 1/2 hour or until the vegetables are tender. Take off the heat and season with the salt, pepper and lemon. Puree the soup in batches in a blender or processor. Strain through a mesh strainer to catch any stray chunks. Stir in the cream, yogurt, or creme fraiche. Chill for several hours and then served garnished with the sour cream, mint, or dill.